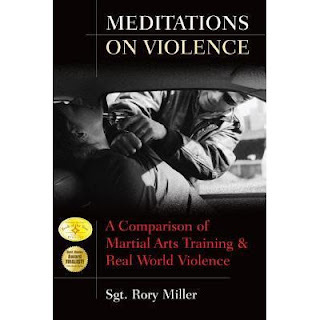 Posting a short piece written by Rory Miller that is from the fuller Chapter 3 of "Meditations on Violence" on pages 54-57. As a corrections officer, I am often thrust into sudden violent situations. On one particular occasion, I responded to an incident between two inmates. One was brushing his teeth. The other came up behind him and struck him on the right side of his head. The tooth brusher tried to turn but was pressed into a corner, punched again and again with hard rights until he curled into a fetal ball. Blood splashed (not smeared) onto the wall at shoulder height. Do you train for this? Do you respect the power of a sudden attack and a constant barrage? The attacker broke several bones in his hand and did not know it. He didn’t break just the metacarpals of a boxer’s fracture, but also one of his fingers was deformed. He did not know it and just kept hitting. He started complaining of the pain several hours later. Do you ever teach that pain alone will stop a committed attacker, that if you break a bone, it’s over? Do you and your students realize how rational, how planned, a sudden assault can be? It’s only sudden for the defender. Far too often “sudden” is part of his plan. Do you understand that there is a sub-group of human beings who can savagely beat another human being while coolly thinking of their eventual court case? Assaults happen closer, faster, more suddenly and with more power than most people can understand. Closer: Most self-defense drills are practiced at an optimum distance where the attacker must take at least a half step to contact. This gives techniques like blocks enough time to have an effect. You rarely have this time or this distance in a real assault. Give some thought to how your technique will work if there is no room to turn or step. Remember that the attacker always chooses the range and the location, and will pick a place and position that hampers your movements. Faster: When your martial arts students are sparring, use a stop watch and time how many blows are thrown in a minute. Even in professional boxing, the number is not that impressive. Then time how many times you can hit a heavy bag in a second. Six to eight times a second is reasonable for a decent martial artist. An assault is more like that. Because the attacker has chosen a time when the victim is off-guard, he can attack all-out with no thought of defense. A competent martial artist who is used to the more cautious timing of sparring is completely unprepared for this kind of speed. You can strike ten times a second. You can’t block ten times a second. More suddenly: An assault is based on the attacker’s assessment of his chances. If he can’t get surprise, he often won’t attack. Some experts will say that there is always some intuitive warning. Possibly, but if the warning was noted and heeded, the attack would have been prevented. When the attack happens, it is always a surprise. More power: There is a built-in problem with all training. You want to recycle your partners. If you or your students hit as hard as they can every time they hit, you will quickly run out of students. The average criminal does not hit as hard as a good boxer or karateka can, but they do hit harder than the average boxer or karateka usually does because of gloves and dojo etiquette. More often than not, the first strike in an ambush will find its target. Fighting with a concussion is much different than sparring. There are specific ways to train to deal with these truths about assault. You must get used to working from a position of disadvantage. Put yourself and your students in the worst positions you can (face down, under a bench, blindfolded to simulate blood in the eyes and with an arm tied in their belt) and start the training from there. No do-overs. Work from the position you find yourself in. There is no “right” move anyway, just moves that worked or didn’t that one time. Contact-response training. Condition (as in operant conditioning) for a quick, effective response to any unexpected aggressive touch. Trained properly, the counter-attack will kick in before the chemical cocktail of stress hormones. This will give you one technique at 100%, and possibly the initiative, to the expected victim. Remember, when you are pumped full of adrenaline, you will loose much of your fine motor coordination, peripheral vision, etc. So you need to have your 100% technique trained to be automatic. Train to “flip the switch”. Make your students practice going from friendly, distracted, or any other emotion to full on in an instant. Make them play music, converse, fold clothes, write or pour tea as an armored assailant attacks. The key is that the distraction must be natural and relaxed, not the jerky half-preparation of someone who expects an attack. In slow motion training, use realistic time-framing. Do not let them pretend that “Monkey plucks jade lotus and presents to golden Buddha” is one move; do not let them pretend that a spinning kick is just as fast as a jab. Get used to being hit, and get used to being touched, especially on the face. For various reasons, face contact between adults is loaded with connotations. Accidental face contact almost always results in both students freezing and can cause an outpouring of emotional sludge. Criminals use this by starting with an open-hand attack to the face (called a “***** slap”) that has paralyzing psychological effects. Teach common sensitivity. They must respond to what is happening, not to their expectations or fears. If there are weapons mounted on the walls of your dojo and you are practicing self-defense someone should be reaching for the weapons or running for the door. Forbid giving up. Winning is a habit. Fighting is a habit. Put them in positions where they are completely immobilized and helpless and set the expectation to keep fighting. In the end, a martial artist is training to injure, cripple or kill another human being. However, in the dojo we cannot go about breaking our students So in any drill where students are not regularly hospitalized there is a DELIBERATE flaw, a deliberate break from the needs of reality introduced in the name of safety. In every drill you teach, you must consciously know what the flaw is and make your students aware of it. NOTE: I highly recommend all of Rory Miller's books!